Inspired by the Food Network and much recently the Food Revolution Day event at Chef Boutique, I made this fresh and fun frozen treat yesterday with friends and family. In a food processor, pulse all ingredients, except for the flakes until smooth and creamy. Scoop into individual ice cream cups and sprinkles with almond flakes and enjoy! This is so versatile and easy. I’m already excited about the many possibilities, this frozen treat can be flavored. 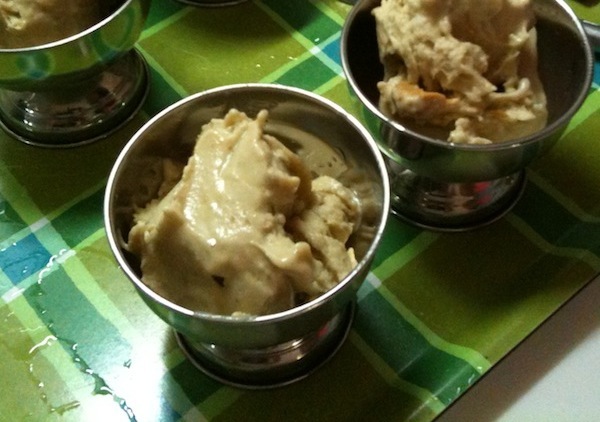 This entry was posted in Dessert, Experiments, Express and tagged bananas, frozen, natural, peanut butter, summer, treats by Budour. Bookmark the permalink.